With more than 52 million pet dogs in America today, it's clear we are a nation of unabashed dog lovers. Yet the relationship between dogs and humans remains a fascinating mystery, as no one really knows what goes on in the canine mind. 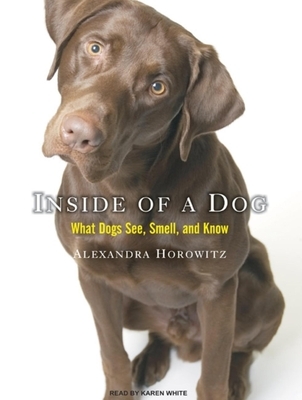 Now, in Inside of a Dog, Alexandra Horowitz fuses her perspectives as both scientist and dog owner to deliver a fresh look at the world of dogs-as seen from the animal's point of view. Inspired by her years of living with her own dog, Pumpernickel, who was a constant source of delight and mystery, Horowitz's mind became filled with questions and ideas. In crisp, clear prose, she draws on her research in the field of dog cognition to give listeners a sense of a dog's perceptual and cognitive abilities-and paints a picture of what the canine experience is like. Horowitz's own scientific journey, and the insights she uncovered, allowed her to understand her dog better and appreciate her more. Containing up-to-the-minute research and providing many moments of dog behavior recognition, this lively and absorbing book helps dog owners to see their best friend's behavior in a different and revealing light, allowing them to understand their pets and enjoy their company even more. Alexandra Horowitz, a former staff member at the "New Yorker," is an assistant professor of psychology at Barnard College who has researched dogs professionally for eight years. Karen White has been narrating and directing audiobooks for more than a dozen years and has well over one hundred books to her credit. Honored to be included among "AudioFile"'s Best Voices 2010 and 2011, she is also an Audie Award finalist and has earned multiple "AudioFile" Earphones Awards for narration and direction.